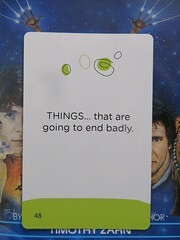 Meet Yaku’sau. 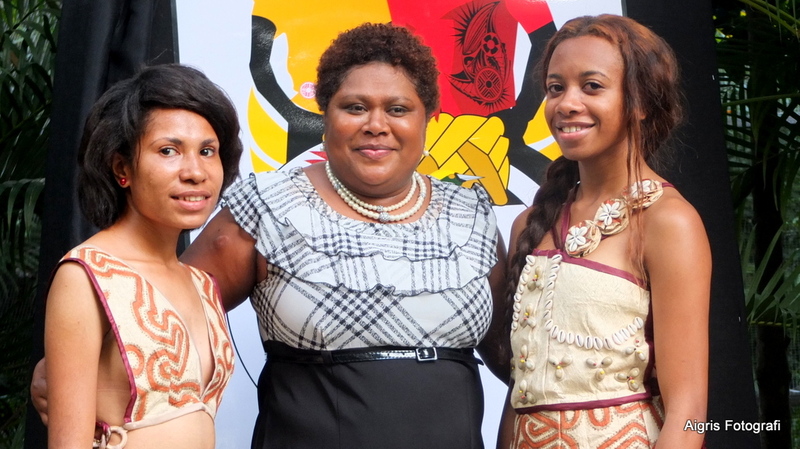 The brains behind PNG Fashion Week and the woman who is spearheading the creation of a new industry in Papua New Guinea. Meet Yaku! 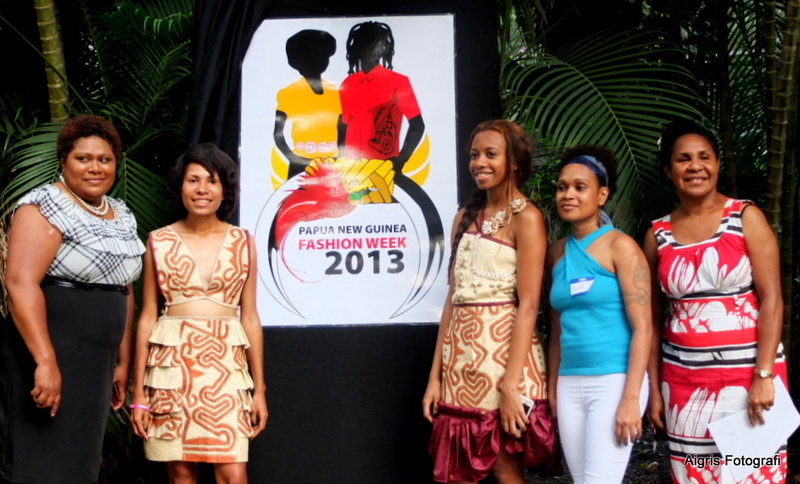 the brains behind the concept of PNG Fashion Week. She is an inspiration to all of us and to all who have a dream and a passion that nothing can keep you away from. Today marked the start of an exciting journey for Yaku and associates plus family and friends who helped and supported them along the way with the unveiling of their awesome logo. I always believe that a logo is the best motivator to drive any plan or idea to fruition and success. Yaku with the unveilled logo at the Nature Park, University of Papua New Guinea. Yaku speaks about her passion with much empathy and conviction and clearly expresses her vision for PNG designs and designers who would make a world of difference to the way we look at fashion in Papua New Guinea. Yaku hails from Morobe and is well-travelled, quietly well-spoken and has a great personality. She is passionate about her vision and dream and what she and like-minded others can do for young talented people and for PNG fashion. 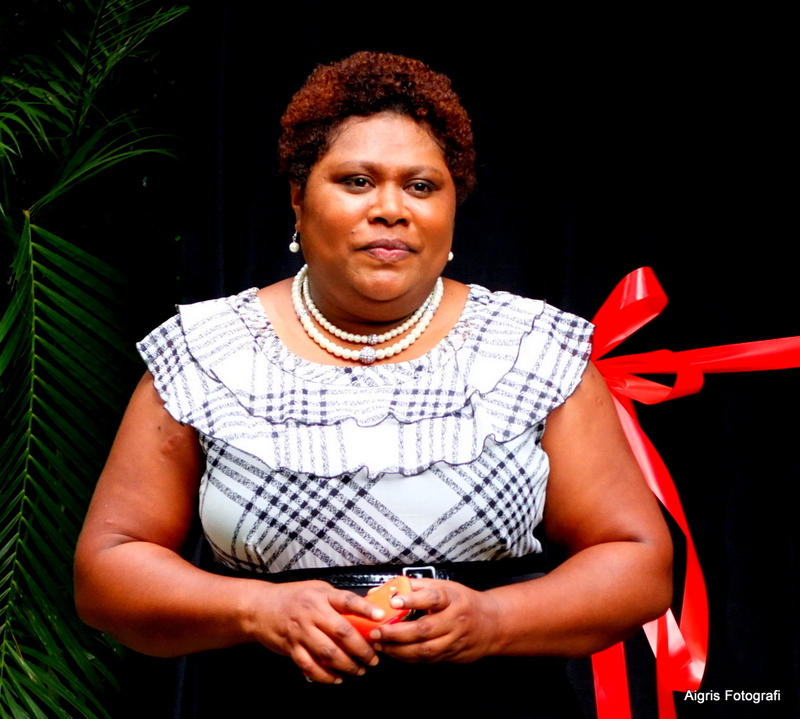 Yaku to me is a true PNG visionary when it comes to talking about her journey with PNG fashion to the development and capacity building of young designers in the not-too-distant future. 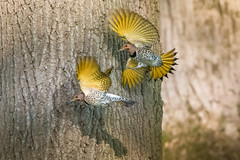 Particularly to capitalise on PNG’s rich cultural diversity and create a unique product that can be enjoyed and treasured by Papua New Guineans and showcased to the rest of the world. Elsie, the designer with the two models modelling her tapa dresses. Awesomely creative and talented. 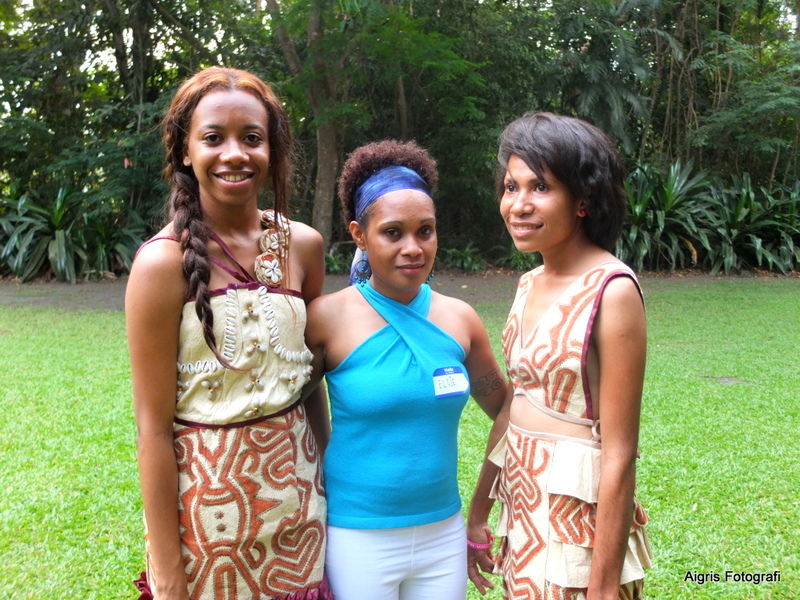 Yaku flanked by the two beautiful young PNG lady models. Dave Conn in his remarks said that Yaku and her fellow collaborators and associates are at the embryonic stages and humble beginnings of a brand new industry. He also said that what we need is not money and more money on SME development but to support and invest in the efforts of young entrepreneurs like Yaku and many more like her out there who are doing something positive and taking a pro-active approach to seek support for their endeavours . 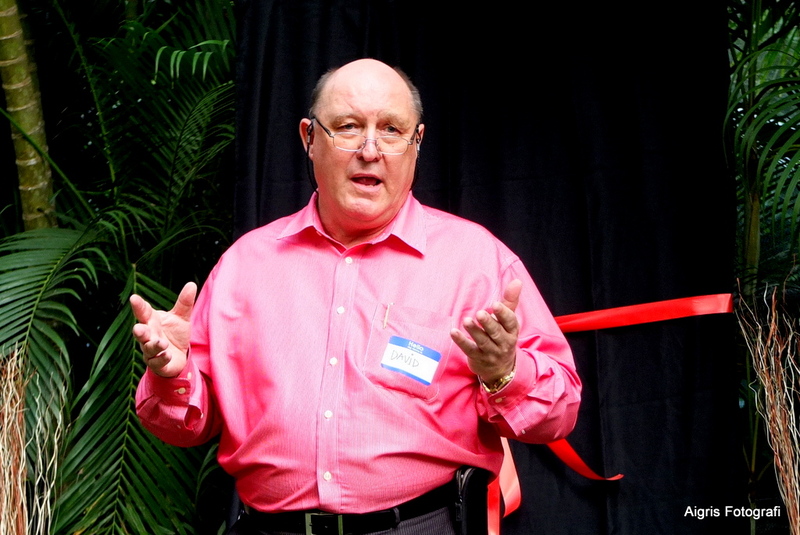 Dave Conn, gave a great encouraging speech and also saying that what Yaku and others are doing is creating a new industry. He also issued an invitation to all entrepreneurs and potential ones that the Chamber is also there to help and support new endeavours. 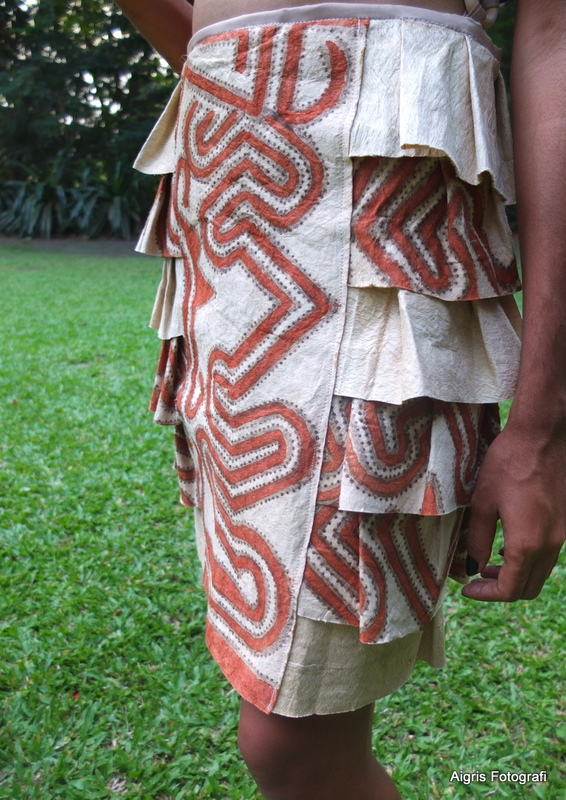 Well done, Yako and co..
Tapa skirt…love the tapa designs which come from the Oro Province of PNG. Yaku is indeed spearheading this great endeavour and this new industry which potentially has so much to offer PNG artistically and culturally in the development of young talent in design and fashion. The shell encrusted strap of the tapa dress is really creative and looks stunning with the shells sewn on to the bodice of the dress. 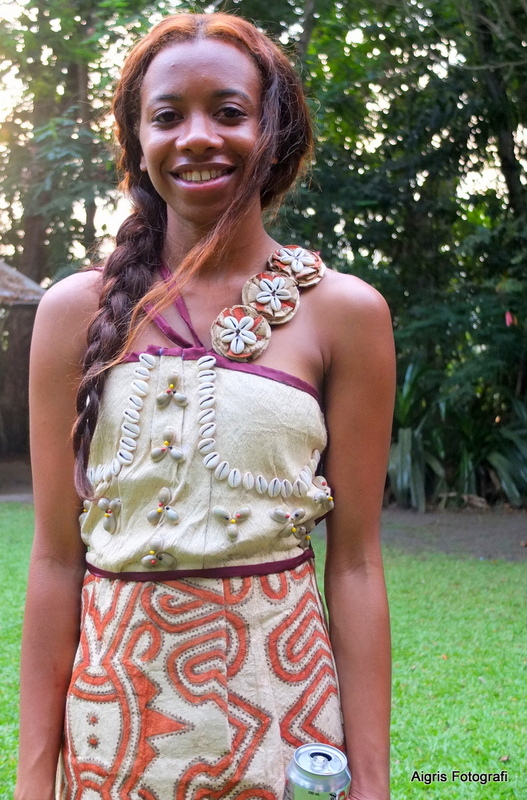 Today I was so proud to discover that the designer of the beautiful tapa-wear hails from Milne Bay so she is a wantok. I am also very proud of Yaku and her collaborators for pulling off the unveiling of the logo for PNG Fashion Week this afternoon. Well done guys, you’ve done us proud. Congratulations. 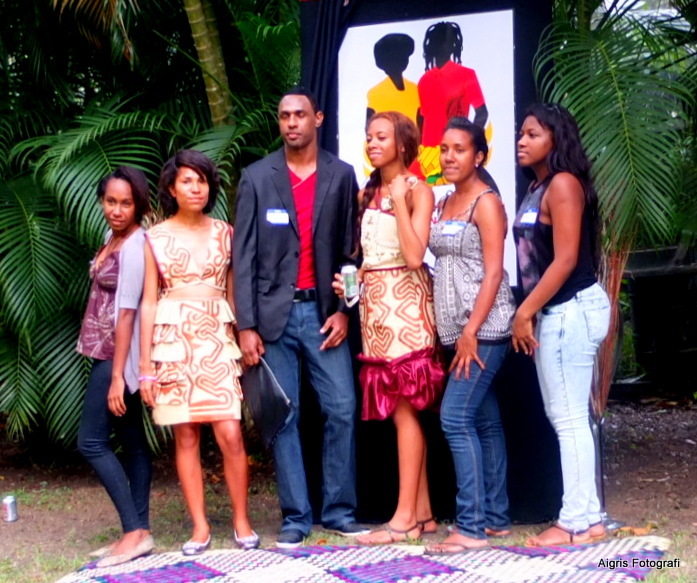 Infront of the logo are, left to right, Yaku, models, Elsie the designer and Sharlene the event coordinator. One thing Yaku said which sticks in my mind is that they want to make PNG Fashion Week a showcase for young talent . 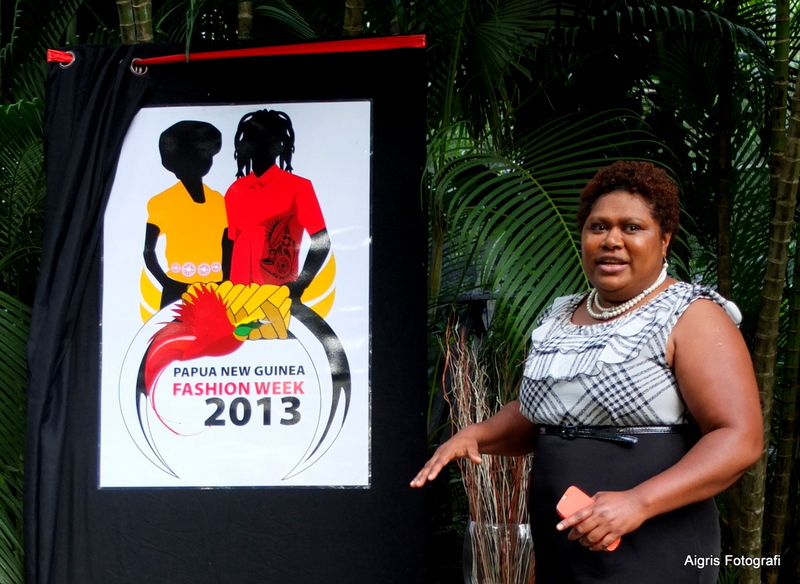 So if you are thinking seriously about fashion the PNG way, then come to the PNG Fashion Week to be held in Port Moresby from 27th – 30th November, 2013. 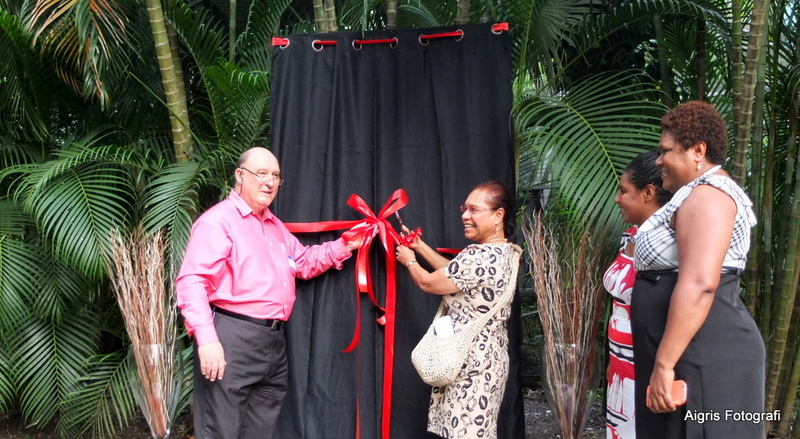 Me cutting the ribbon…holding up the ribbon is Dave Conn, CEO of the PNG Chamber of Commerce and looking on are Yaku, and Sharlene who was the events coordinator for this significant event. Thank you Yaku and Sharlene for giving me the honor of cutting the ribbon. You are on your way in the race for a new unique fashion, a ‘made in PNG’ brand in and at the front of your game.